Nature Art trees,forest,clouds,pastures and fields collection by Laurie Rohner. 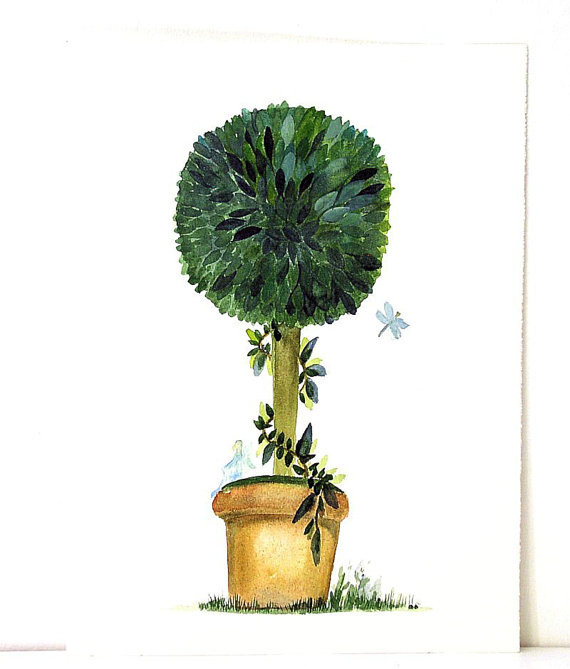 Original garden topiary watercolor with fairy and dragonfly. 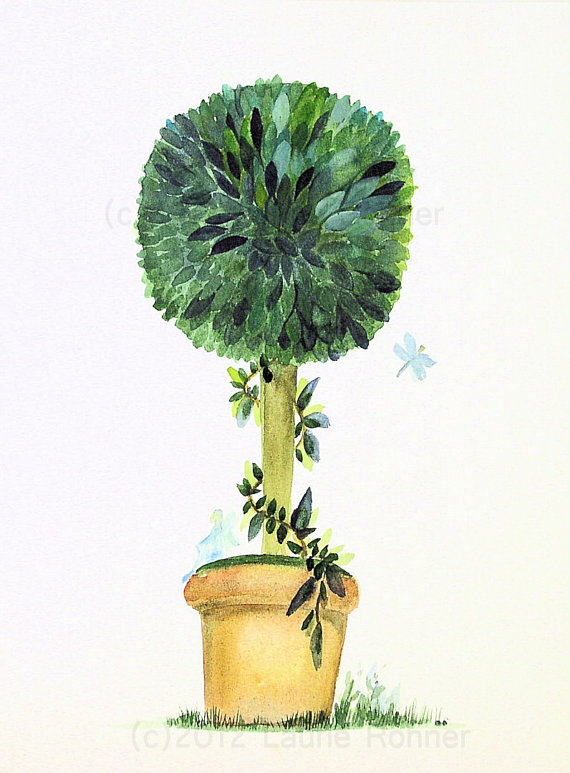 Woodland Garden cottage topiary watercolor painting has a woodland fairy sitting on the moss clay pot while a dragonfly buzzes by. This whimsical original watercolor illustration rendering is by Laurie Rohner. 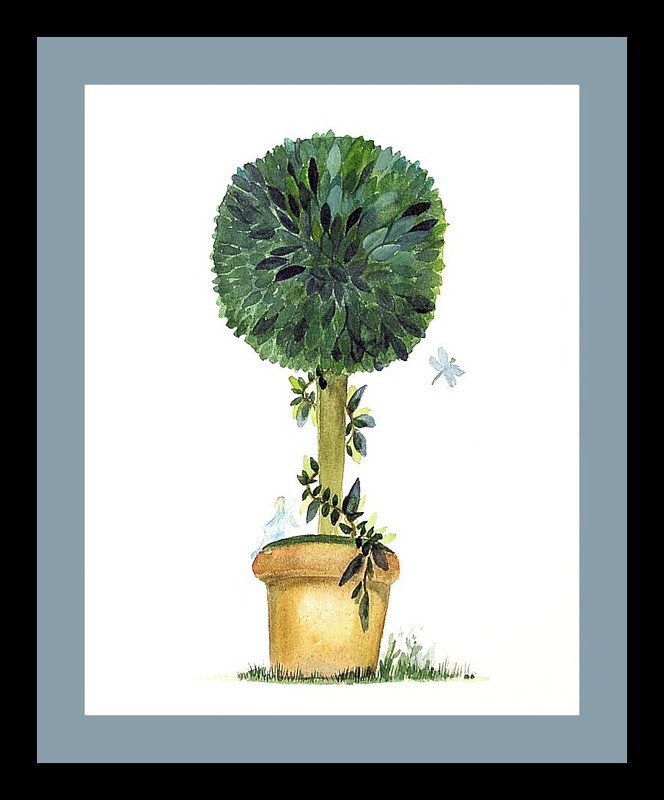 The topiary is rich with hunter greens and navy with a twining vine down the trunk. Moss just pops up over the rim of a Tuscany clay pot where a fairy shimmers in between our world and hers. Of course a dragonfly is buzzing by. Palette: deep rich greens, navy blue, clay brown, powdery blue, aqua, teal, brown, cream paper. Image size: 12.75" x 6.5"
Photo with frame is to give you an idea of what this wonderful playful painting would looked framed with a matte. * All US domestic packages are shipped via Priority Mail. The Domestic shipping cost is estimated based on the furthest zone from me. That said, I ALWAYS refund the extra shipping cost if it comes out to be grossly over estimated for your location. I DO NOT make money off the shipping cost.